Mostly marketing, SaaS, and remote work – some other stuff too. Onward and upward. This year’s College Football National Championship was a played between Clemson and Alabama, two teams that have dominated the sport for the last decade. Combined, they have won 7 championships since 2009. On Monday both teams went into the game with a 13-0 record. By some scouts’ estimation, there were 30 future NFL players on the field. On this night Clemson got the better of the Tide, but to me, the most remarkable takeaway from the game was the culture of consistency that both programs have been able to build in their own way. The two coaches, Nick Saban, and Dabo Swinney, couldn’t have more different styles. Oftentimes growth teams get so focused on user acquisition that they forget about the denominator of their acquisition metrics. By increasing lifetime value (LTV) your acquisition economics improve along with margins. At Code School, we faced a different challenge than most SaaS companies – which caused us to think more deeply about increasing LTV. Because we were a content company, and one with less content than our competitors, we had to continually give users a reason to continue their subscription each month. Most of this is done by adding a layer of context around courses or groups of courses to show what was possible when completing courses and Paths. Once you hit product-market fit a lot of the growth challenges lay in getting customers to remember your brand. This is especially true when you are in a crowded space with competitors that have similar product offerings. Some differentiation can be made through branding efforts, but it usually comes down to if potential customers remember your company at a time when they are ready to buy. 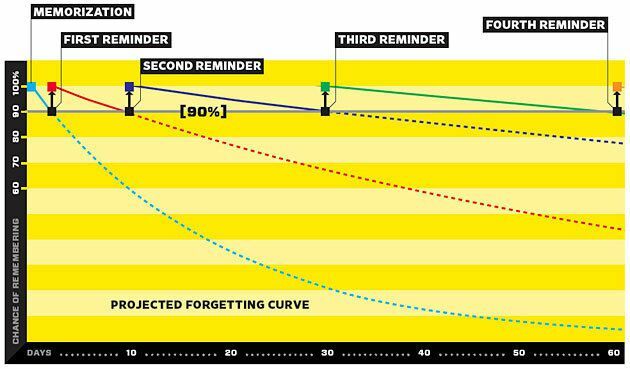 Wired recently featured an interesting graph that showed the likelihood of people remembering a topic based on how many times they received a reminder. While the study that the graph is derived from has more to do with memorization, there are definitely some potential marketing applications for the data. Using this graph goal, there are tactics that you can use to increase the chance that a customer remembers your product when they are ready to buy. Friction is a somewhat ambiguous term that usually refers to sticking points that lead to hesitation, confusion or mistrust amongst consumers while using a website or app. Friction can cause low conversion rates, low engagement and ultimately lead to people deciding not to use your product or service. One of the most common friction points is users’ first impression with your website. If they can’t figure out exactly what you do and how you can help them in a second or two, you’re almost guaranteed to lose them. Marketing automation has become an essential part of any marketing plan. It allows companies to provide event-specific messages to customers based on actions that customers take. However, when people discuss marketing automation, they almost exclusively talk about email as the delivery method. At Code School, we experimented with a lot of tactics to grow traffic and increase subscribers. As a bootstrapped company we had to get creative about how we approached growth. Now looking back at the success we had, one of the biggest takeaways for me, from a marketing standpoint, is how valuable email was. I spent around 50% of my time in my first year at the startup developing our email program from the inside out. This included revamping our transactional emails, launching upsell and onboarding campaigns, and maintaining a weekly promotional email schedule and newsletters. All in all, we sent over 30 million emails over the course of the year that first year. A conservative calculation put our email ROI at 20-30x – and that’s just last-click conversions. Using multi-channel attribution would likely double that ROI number. Below are some of the things I learned along the way.